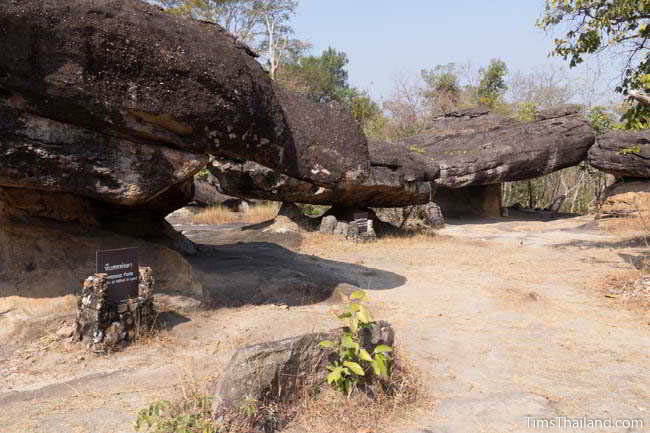 Phu Phrabat Historical Park, spread out around the top of a small mountain range, was an important Dvaravati religious site from around 1000-1200 CE. It was deep wilderness, but as many as 100 monks resided here and they adapted the rocky landscape into shrines and dwellings. 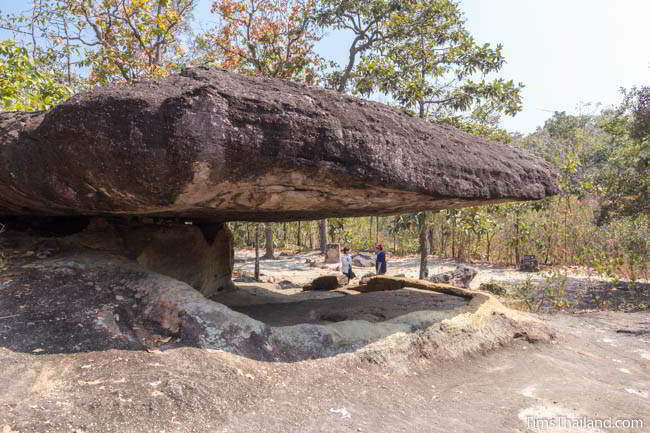 Many Buddhist rock carvings and bai sema sacred boundary stone markers from that period remain, as well as pre-Dvaravati cave paintings. But the natural beauty, not the history, is the biggest draw and there are many large, oddly eroded rock formations scattered about. Many of these feature in a fairy tale about a king, his stunningly beautiful daughter, a hermit and a lovestruck prince from another kingdom. Once upon a time, a small kingdom on the banks of the Mekong River near what is now Nong Khai city was ruled by the honorable King Phaya Kong Phan, whose queen never bore him a child. Naturally, the king grew increasingly dismayed about this. During this time a baby girl was born in a lotus flower deep in a remote mountainous region above the kingdom called Phu Phrabat. The old and wise Ruesii Chanta who lived there found her and cared for her. One day the king saw her and asked to adopt her. The ruesii could see the future and so warned the king that if he adopted this baby and she got married, the husband would eventually cause the king's death. Longing a family, the king ignored the warning and adopted her anyway. He named her Usa ("First Light of Dawn") and she grew up to be a wonderful child loved by all. The king and queen gave her the best of everything and she brought them great happiness. Once Nang Usa reached her teens, she caught the eye of many men and the king remembered the ruesii's warning. To keep her away from men, and thus protect his own life, he sent her and some other women of her age to the forest to study with the ruesii. He did not tell her the real reason for sending here there. She lived in a small room built into a natural stone tower. Her parents visited occasionally, but otherwise she was alone with the ruesii and her companions. Nobody else ever came to see her. One day, in order to find her soul mate, she floated a flower garland down the small stream in which she bathed. The next morning her signal reached the Mekong River where, by great fortune, it was found by Prince Tao Baros (pronounced bah-rote) of a neighboring kingdom who was in the river fishing for giant Mekong catfish. He instinctively knew that the person who sent it must be a beautiful woman, so without hesitation he got on his horse and followed the stream to find who had sent it. He arrived in a village on the edge of the mountains at dusk, but rather than doing the wise thing and resting there for the evening, he bought a lantern from an old woman and climbed to the top. 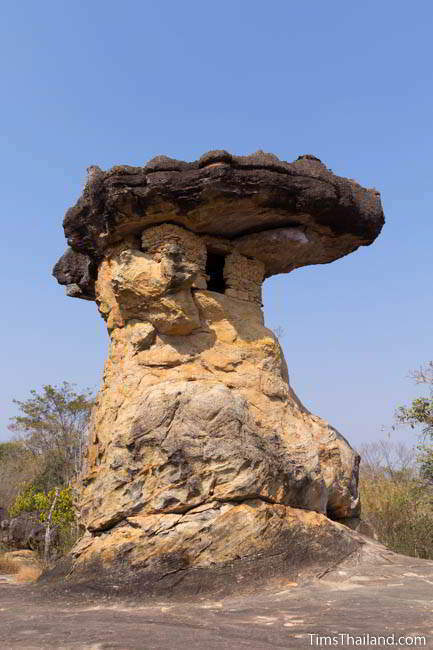 By midnight he arrived at an area of strange mushroom-shaped rock formations. His horse refused to walk anymore, so he tied it up under one of the strange rocks; now called Baros's Stable. At dawn he found Nang Usa's tower and saw her face in the morning's first light (so her name was prophetic) and they immediately fell in love. The ruesii saw them together and alerted her father. That afternoon two groups of people arrived atop the mountain. The first was the friends and servants of Tao Baros who had come to find him; they kept their horses at what is now called the Minor Stable. The other group was the king and his entourage. The ruesii told them not to fight but instead to talk. The king's advisers proposed a contest to settle who would get to keep Nang Usa. Whoever could build the best Buddhist temple over the course of the night, before the morning star (Venus) rose in the sky, would win. The loser would be beheaded. The king had far more people in his team, but Tao Baros had no choice but to accept because it was a religious matter. 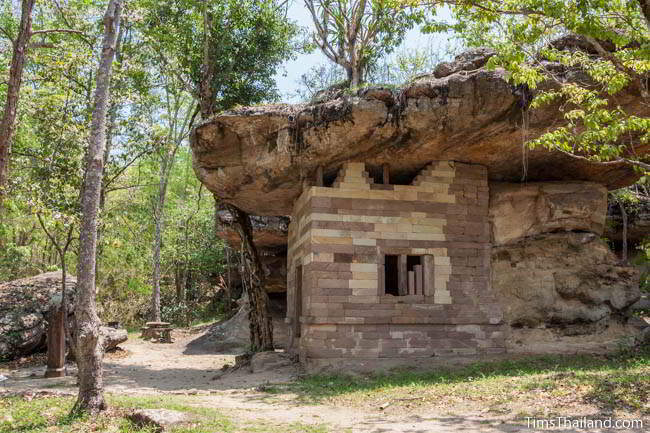 The king chose to make his temple in the valley where there was ample wood and stone while Tao Baros decided to build up top so he could use one of the overhanging rocks as a roof. At one point, deep into the night, Tao Baros walked to the edge of the cliff to see the king's temple and knew that he would lose. And then he had an idea. He climbed a tree and turned up the lantern as brightly as possible. Soon after he could see people below stop working and point and say "The morning star." But the men assigned to be the judges were camping at the far end of the cliff and had not seen the lantern. Tao Baros rushed back to his temple and made sure that before morning truly arrived it would be completed and tidy, despite being very simple. 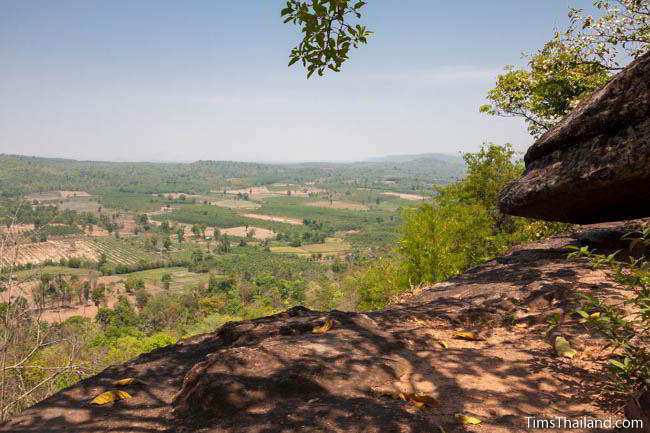 View from Pha Sadet cliff. Life at the palace was not easy for Nang Usa since other noble women who had hoped to win the prince's hand were cruel to her. One day one of these women met an old candle-selling woman who told her of a lantern found high in a tree at Phu Phrabat cliff by her daughter while out collecting firewood one day. The true story behind the prince's victory now known, the court astrologers insisted that Tao Baros must wander in the wilderness for one year to cast out bad spirits. Nang Usa grew depressed living alone at the palace and so returned to the tower to live with the ruesii. But her depression did not pass and she grew seriously ill. The ruesii sent for Tao Baros to come see her. Upon hearing the news he immediately came, even though his penance in the wilderness would need to begin again. But he only arrived just before she died. Heartbroken, Tao Baros died soon after and they are now buried beside each other in rocks near her tower. Legend says that they were later reborn as the god Indra and his queen, Indrani.